When the temperature rises above 75°F, grazing livestock benefit from shade and cooling. Shade can be as simple as trees planted in or on the border of pastures. During early afternoon, there should be a minimum of 25 square feet of shade per animal. This can be challenging when intensively grazing small paddocks with many cattle. One solution is to allow easy access to barns during the hottest part of the day when cattle are not as apt to be actively grazing. Some producers use portable shades made from pipe frames topped with shade cloth. These shades can be towed from pasture to pasture and used in bedded corrals. For an example of one design for cattle shade, see the University of Kentucky Cooperative Extension Service factsheet, Shade Options for Grazing Cattle. 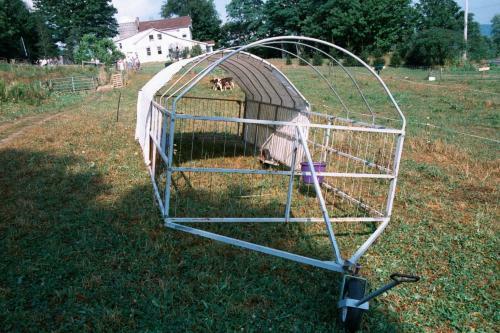 An example of mobile shade structure for grazing animals. Photo credit: Mike Gamroth, Oregon State University. Turner, L. W. 2000. Shade options for grazing cattle. Agricultural Engineering Update, AEU-91. University of Kentucky Cooperative Extension. Available online at: http://www.bae.uky.edu/Publications/AEUs/aeu-91.pdf (verified 21 March 2010).